Already own a home in the D S Brown subdivision? Thinking of selling? Click here and read about current search trends & our web network. D S Brown homes for sale are all listed below on this page and along with current listings, is pictures, an interactive Google map, property details and other additional info for homes for sale in the D S Brown subdivision in Fairhope, Alabama. 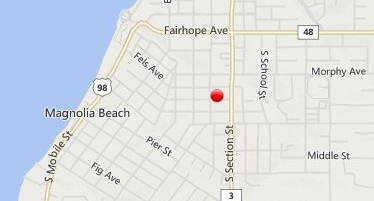 The homes are located in the heart of Fairhope gives you a sense of historic Fairhope charm at it's best. Enjoy cottage style living within walking or biking distance to the bay. Homes here have three bedrooms, two bathrooms, and 1600-1800 square feet. From I-10, south on US 98, right on Scenic 98 (Section St), DS Brown subdivision is south of Fairhope Avenue. If you need further info, have questions or would like to schedule a viewing for any of the homes for sale in DS Brown or any other properties in the area, please email info@condoinvestment.com or call (251) Area-Pro (251-273-2776) for immediate assistance.